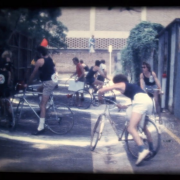 Presented at the 2018 edition of LOOP Barcleona, Bicycle Race is one of a number of early experiments into different forms of performance, seeking to understand how time, action and concept can work together. From 1977 until 1979, conceptual artist Derek Krecker staged a series of specific situations where chance and the unknown ultimately influence an otherwise structured set of choreographed actions. Bicycle Race started as a pencil drawing of a double helix which was transferred onto a public road using twenty five kilograms of flour. 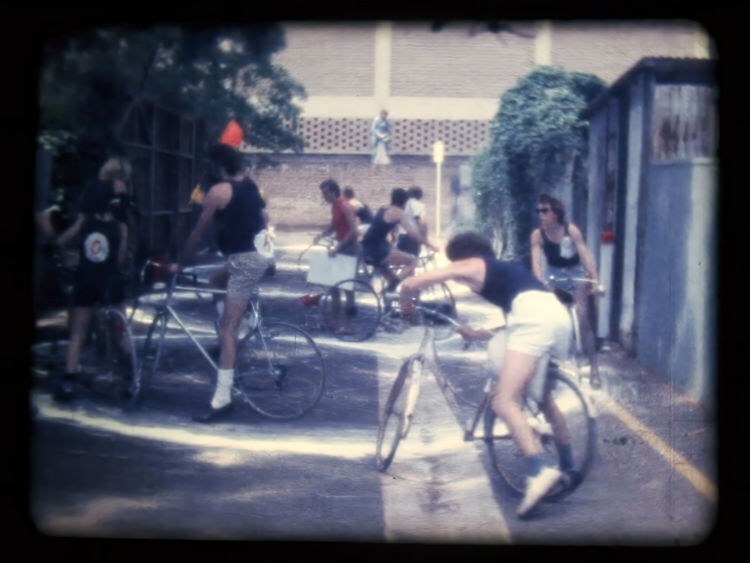 Within an approximate 20 minute time frame, individual cyclists entered the circuit one by one, each after the previous cyclist had completed one lap of the course, until fourteen cyclists were in rotation. Although the instructions and parameters were clear, under such conditions neither the audience nor the participants can anticipate the outcome. As tension grows and collision becomes unavoidable, the performance enters a space where we can no longer predict what will happen.